Nick Zahos was just 17 when he suddenly went into cardiac arrest. Doctor's weren't sure why it occurred, but one thing was certain: Nick wasn't ready for his football playing days to be behind him. Nick Zahos lay in a New Brunswick, New Jersey, hospital bed wondering if life as he knew it was over. Just an hour before, the 17-year-old had been home with his family settling in to watch the Pittsburgh Steelers take on the Dallas Cowboys, when his heart suddenly stopped beating. By all appearances, Nick was more than healthy. 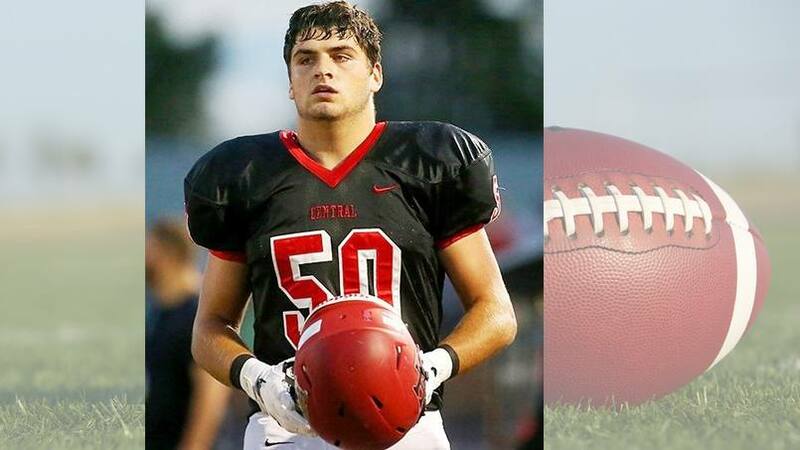 NJ.com writer Matthew Stanmyre describes him as "a 6-foot-1, 215-pound football and lacrosse star capable of bench-pressing 245 pounds and running a mile in less than eight minutes." Yet there Nick was, unconscious on the floor while his older brother, Tommy, administered CPR and his father dialed 911. When police and paramedics arrived, Nick was shocked back to life with an automated external defibrillator and flown to a nearby hospital, where he slowly regained consciousness. The days that followed would do little to explain what had happened. Stanmyre reports that all of Nick's test results "came back negative." More tests at another medical facility yielded the same results. Doctors remained "baffled" over what had caused Nick's heart to suddenly stop. "Even so," Stanmyre writes, doctors "told him he likely needed an implantable cardiac device — and he would most likely never play competitive contact sports again." Specifically, no football, a sport that Nick tells Stanmyre is almost as much a part of him as the heart his doctors were trying to figure out. "To me, football is almost oxygen," Nick says. Which is why Nick and his family then flew from New Jersey to Mayo Clinic's Rochester campus in February 2017 "to consult with renowned genetic cardiologist" Michael Ackerman, M.D., Ph.D., to see what, if anything, could be done to get Nick back onto the gridiron. As Stanmyre reports, Dr. Ackerman and team began by testing Nick "for all of the known heart conditions capable of causing sudden cardiac arrest." When those tests came back negative, they diagnosed Nick with "idiopathic ventricular fibrillation." Meaning, as Stanmyre writes, that while Nick had most certainly "suffered sudden cardiac arrest, they don't know why it happened." What Dr. Ackerman and his team did know, however, was that they were open to Nick someday returning to football, given the research Dr. Ackerman and others have done related to the feasibility and safety of young patients with implantable cardiac devices playing sports. "I try to get a gauge with an athlete and his parents — is that sport optional, or is that sport oxygen?" Dr. Ackerman tells Stanmyre. "For the family and the athlete where it's utterly optional, we don't try to keep them in their sport. But there are many where that sport is oxygen to them." And that, Stanmyre reports, was Nick. With this new hope in hand, Nick's family elected for him to have an implantable cardiac device surgically placed by Dr. Ackerman and his team. Dr. Ackerman, Stanmyre reports, placed the device "in a unique spot" in Nick's abdomen, "tucked behind his rib cage on the right side of his body." Such positioning would "provide a measure of protection for the device if Nick returned to contact sports." And earlier this fall, after conquering "one challenge at a time" in his rehab, Nick received the go-ahead from Dr. Ackerman and his school's physician — just 10 months after finding himself in a hospital bed wondering about his future. Although Nick knows there's still risk, that's not enough to keep him on the sidelines. "I'm just not even focused on it," he says. "I'm just playing the game I love." You can read the rest of Nick's story here. Go deep and let us know what you think by sharing your comments below. Use the handy social media tools atop this page to share this story with others.